Leviton Lampholder Guard, For Use With: Porcelain Lampholders and Temporary Lighting, 10 in, Plastic, White, Usage: Ceiling Lampholders Incandescent work light with 13 amp outlet and a tough metal cage. Heavy gauge 16/3 SJT cord. 13 amp outlet. UL listed. Porcelain socket clamp without switch. Screw in a light bulb and clamp the socket where needed. 150 watts/125 volt. Ball joint for easy positioning. Tough, no scratch clamp. Bulb not included. 6 ft. 18/2 SPT-2 cord. UL listed. Ball joint for easy positioning. Tough, no scratch clamp. Bulb not included. 6 ft. 18/2 SPT-2 cord. UL listed. Sturdy 10" aluminum reflector with guard grill. Ball joint for easy positioning. Tough, no scratch clamp and hang hook. 300 watt bulb maximum, not included. 6 ft. 18/2 SVT-2 cord. Cooler bulb, safer to touch. Bulb included, lasts up to 7 years. Hang hook. 6 foot 18/2 SJT cord. UL listed. Similar amount of light to a 75 watt incandescent bulb but with daylight color (7000 Kelvin). Tempered glass lens with metal safety grill. All weather 3 foot, 18/3 SJTW cord with molded plug. Spare bulb included. 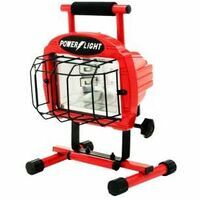 Incandescent work light with 13 amp outlet and a tough metal cage. Heavy gauge 16/3 SJT cord. 13 amp outlet. UL listed. Tough, almost unbreakable housing protects bulb. Bulb included, lasts up to 7 years. Cooler bulb, safer to touch. 12 amp grounded outlet. Spot light top. Hang it, stand it or hold it. Similar amount of light to a 75 watt incandescent bulb but with daylight color (7000 Kelvin). 6 foot, 16/3 SJT cord. UL listed. S stand w/ foam grip handle - Complete w/ 500W halogen bulb - Limited 2 yr warranty TPE rubber provides superior flexibility at sub-freezing temperatures. Resists stiffening or cracking under the most extreme weather conditions. Power indicator light allows you to see when the cord has power. Oil resistant jacket will not deteriorate when used where oil or petroleum products may be present. Flame retardant, protects against accidental cord fire. Water resistant, will not absorb water that can corrode copper conductors or cause dangerous electrical shocks. TPE rubber is 30 percent lighter weight than standard rubber cords. Blue with orange stripe. Globe Electric Trouble Light Stick, Weatherproof, LED Lamp, 27 Lamps, 100000 hr Average Life, Plastic, Yellow, Includes: (6) Rechargeable AA Nickel/Cadmium Batteries, Usage: Outdoor Use CCI Work Light, Portable, Series: Contractor, 120 V, 500 W, Halogen Lamp, 500 W Lamp, 1 Lamps, Corded Electric Power, 8000 lumens, 18/3 AWG Cord, 3 ft Cord Length, NEMA 5-15P Enclosure, 14 in Overall Height, Die Cast Metal, Powder Coated, Orange, Includes: Floor Stand With Handle, cUL, UL Listed, For Large Residential Construction Projects Metal guard has a flip-lock for bulb replacement and a hanging hook. Grounded outlet in handle. Blue 16/3 gauge SJTW wire. 13 amps, type A bulb (not included). 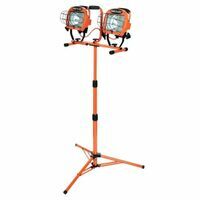 CCI Work Light, Portable, Series: Pro, 600 W, Halogen Lamp, 300 W Lamp, 3 Lamps, 10800 lumens, 18/3 AWG Cord, 5 ft Cord Length, 8.2 in Overall Length, 5-1/2 in Overall Width, 12-1/2 in Overall Height, Die Cast Metal, Powder Coated, Red, cUL, UL Listed Shatter-resistant polycarbonate lens. Cool to the touch. Powered by 6 foot AC Adapter, (110v to 240v). 15 watts, 1000 lumens, 4000K, 75 CRI, 120 degree beam width. Metal guard has a flip-lock for bulb replacement and a hanging hook. Grounded outlet in handle. Blue 16/3 gauge SJTW wire. 13 amps, type A bulb (not included).